Millers Oils has a reputation for the quality and technical excellence of its products. Continued investment in product innovation, spearheaded by the involvement in many areas of motorsport, has resulted in a range of high quality premium products that customers can trust to provide exceptional reliability, performance and protection. 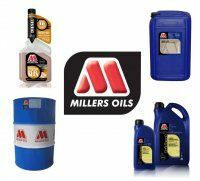 Dennis McBride Sales and Marketing have recently been appointed distributor for Millers Oils in N. Ireland. We stock an extensive range of automotive, commercial, industrial, agricultural and motorcycle oils and also the range of fuel additives and treatments. Advise on which lubricant to use. OEM recommendations for vehicles and equipment. Recommendation on the correct use of our products. Material Safety Datasheet (MSDS) support. "Which Oil?" is a detailed engine oil and transmission oil recommendation and application guide for cars and light commercial vehicles. All the application information is now published on the Millers Oils web site. Simply enter the vehicle registration number or alternatively select the make, model, engine size and age of the vehicle and then read off the recommended engine oil and transmission oil. Then call us on 028 92 639653 or email info@mcbridelubricants.com for a price and delivery options. Also call or email for any industrial lubricants, commercial engine oil or fuel additives recommendation.